“It was in this Church of Rock & Roll that I learned how to put on a show. 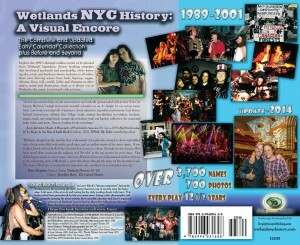 I’m lucky for that because Wetlands stood alone in placing the audience and “the vibe” as the top priority for every show.” Peter Shapiro, former owner Wetlands (97-01) / Owner Brooklyn Bowl, New York, Las Vegas and London, and The Capitol Theater, Port Chester, NY. See the list of bands, performers and speakers named in the book – link is to the right.